Are you wanting to host a Football themed event? Well then look no further as Lichfield Entertainments probably offer the largest variety of football theme entertainments and games for hire in the Midlands. 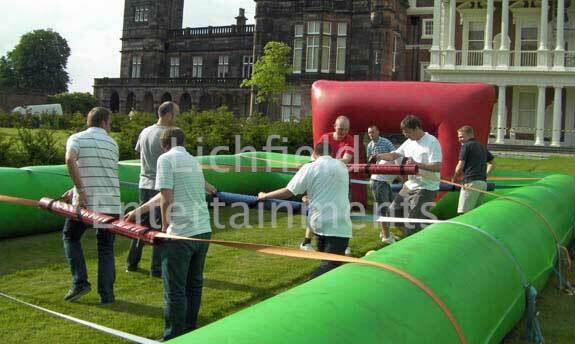 Most inflatables can be hired individually or we can put together an excellent package of suitable football theme amusements for your event. How great is this football game? Cross darts with football and you have Football Darts! We have two different sizes of this game - the large 15ft tall version and the massive 27ft tall version that makes the perfect centre piece attraction for any football event. Like the football darts Footpool is a game where another sport is improved by combining it with football! Suitable for ages 6 upwards for both indoor and outdoor events. Human Table Football is a giant version of foosball where the little spinning plastic players are replaced with real people - only they don't need to spin round! Great fun for team events. Football themed rodeo ride. How long can you stay on the spinning and rocking football before you fall off? This football theme game is an inflatable goal with 4 target circle cut-outs for the kicker to try and kick the ball through. Available in two sizes: 7x10ft for venues where space is an issue or a larger 15x15ft version. No more using straws to blow ping pong balls around the kitchen table with our brilliant Blow Football game. This six player game uses flexible air jets to power the ball around the inflatable pitch. So what are you waiting for? 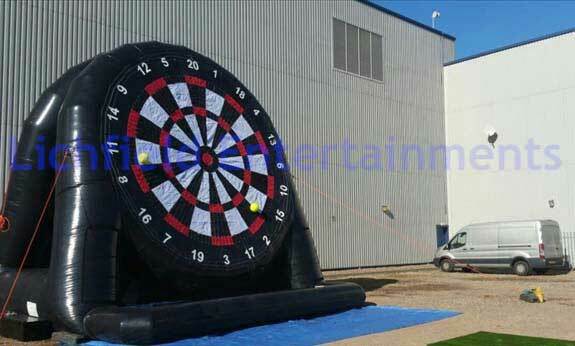 Hire your inflatable football theme games today and get your party started in the right direction. If you have any queries, questions or would like to hire an inflatable football game, please click here to enquire and we will do all we can to help.